Here's the puppet head for Nev Bezaire's stop-mo project "Foxed", with the silicone skins attached ( and here, without). The skins were sculpted, molded, cast and applied by Brenda Baumgarten. She and I worked closely to work out the dozens of things that can go wrong in a build like this one. You really have to think 10 steps ahead. Each element has to work and fit properly with every other element. Plan and measure every aspect. Without a clear, step-by-step plan and strategy, chances are you'll run into trouble when you get to the final assembly. Eyeballing and hoping for the best won't work on this kinda thing. 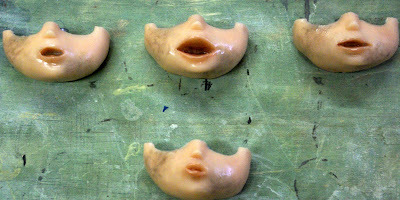 The mouth "cartridges" with skins. The seam where they come together with the head will be hidden digitally in post-production. The final stage is bit of colour. Here, they're being painted by F/X artist Kevin Hutchinson of Second Skin Creations. Since few things in the universe stick to silicone, besides itself, the skins were painted with a diluted silicone solution. Tricky and toxic. Brenda did a great job casting and seaming the hands. Getting a sooty paint job here. Say, amazing -- so creative and careful -- two adjectives that rarely are seen together. shockingly good stuff ramping up to the I understand door. Congrats on a great blog, Graham.